Warts are benign (not cancerous) skin growths that appear when a virus infects the top layer of the skin. It is small, rough lumps or growths on the skin caused by the human papilloma virus (HPV). Most people get one at some point in their lives. It can grow anywhere, but warts are most common on hands, knees, and feet. A wart on the sole of the foot is called a verruca. There are four main types of warts caused by the human papilloma virus (HPV). They look different but are all essentially caused the same way. Common wart: These are firm, round, raised growths with a rough surface, which can look like a very small cauliflower. They are generally skin colored, but often have tiny black dots on the surface. They’re commonly found on hands or knees. They are usually a few millimeters across but can range from the size of a pinpoint to 1cm across. Verruca (plantar wart): Verrucas are warts on the soles of feet. They may have tiny black dots in the center and can be painful when putting weight on them. They tend to look quite flat because of the pressure put on them. I have clusters of verrucas, they can fuse together. These are called mosaic warts. Plane wart (flat wart): A plane wart is a round, smooth growth that’s often yellow in color. They may be flat or slightly raised. May have one, a few grouped together or even a group of hundreds of these warts. They commonly appear on face, neck, the backs of hands or legs. Genital warts: Genital warts are caused by different types of HPV than the other types of wart. They are spread by sexual contact and are the commonly analyzed sexually transmitted infection (STI). If anyone has these warts, it’s important to go to a doctor for further advice. The doctor will treat differently to other types of wart. HIV weakens the immune system, so the body often cannot fight the virus that causes warts. In children, warts often go away on their own. In adults, they tend to stay. If they hurt or bother or if they multiply, needs to remove them. Chemical skin treatments usually work. If not, various freezing, surgical and laser treatments can remove those warts. Warts and verrucas don’t usually cause any symptoms. Warts and verrucas may find uncomfortable or painful if they’re on feet or near nail beds. Sometimes common warts may crack and bleed. There are a few different types of warts. The type is determined by where it grows on the body and what it looks like. The following describes the symptoms for some of the different types of warts. Common warts: see a wart on the child’s face, check the child’s hands for warts. The virus that causes warts can spread from the hands to the face through touch or nail-biting. Are more common where the skin was broken, such as from biting fingernails or picking at hangnails. May have black dots that look like seeds (seed warts). May hurt, feels like have pebbles in the shoe. May occur anywhere. Children usually get them on the face. Men get these most often in the beard area, and women tend to get them on their legs. Warts and verrucas are caused by the human papilloma virus (HPV). There are over 150 different types of HPV but most warts are caused by only a few specific types. The virus infects cells in the skin, causing it to thicken and coarsen. Warts and verrucas can spread from person to person by direct skin contact. They can also spread by contact with floors or surfaces contaminated with the virus. Although warts are contagious, it’s thought that the risk of catching them is fairly low. More likely to get infected if the skin is damaged or wet, so infection can be linked to swimming pools and communal showers. Self-infection may occur. If scratch a wart or verruca, the viral particles may spread to other areas of skin. Many children get warts. Warts also are more common on parts of the body that people shave such as the beard area in men and the legs in women. Warts and verrucas also developed if have a weakened immune system. Like: have had an organ or stem cell transplant. Warts and verrucas are usually harmless. Warts need no treatment when children get warts. In adults, warts may not disappear as easily or as quickly. Most warts are harmless. Need treatment if cannot get rid of warts, warts hurt, or have many warts. There are many treatments for warts. The treatment used depends on the patient’s age and health as well as the type of wart. Cantharidin: Treat a wart by painting with cantharidin. Cantharidin causes a blister to form under the warts. In a week or so, clip away the dead wart. Cryotherapy: For common warts in adults and older children, cryotherapy (freezing) is the common treatment. This treatment is not too painful. It can cause dark spots in people who have dark skin. It is common to need repeat treatments. Laser treatment: Laser treatment is an option, mainly for warts that have not responded to other therapies. 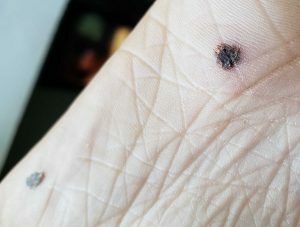 Before laser treatment, the dermatologist may numb the wart with an anesthetic injection (short-acting). Chemical peels: When flat warts appear, there are usually many warts. Dermatologists often prescribe for many warts peeling methods to treat these warts. This means will apply for a peeling medicine at home every day. Peeling medicines include strong salicylic acid, tretinoin, and glycolic acid. Bleomycin: Inject each wart with an anti-cancer medicine, bleomycin. The shots may hurt. Immunotherapy: This treatment uses the patient’s own immune system to fight the warts. This treatment is used when warts remain despite other treatments. 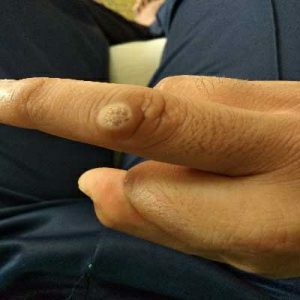 One type of immunotherapy involves applying a chemical, such as diphencyprone (DCP), to warts. A mild allergic reaction occurs around the treated warts. This reaction may cause the warts to go away. The lesion is bleeding, painful or changes in appearance or color. Already tried treating the wart, but it persists, multiplies or recurs. Also, have diabetes or poor sensation in feet. Also have a weakened immune system because of immune-suppressing drugs, HIV/AIDS or other immune system disorders. Aren’t sure whether the lesion is a wart. So, need a proper analyze.